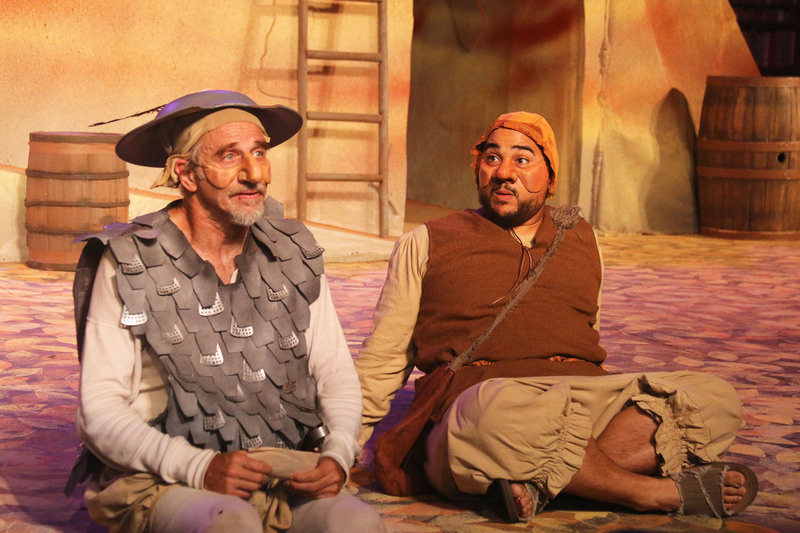 Don Quixote (Ron Campbell) and Sancho Panza (John R. Lewis) share a quiet moment in the midst of their misadventures. Photo Credit: Lorii A. Cheung. Don Quixote de la Mancha is one of a very small group of fictional characters instantly recognizable to almost anybody. Who hasn’t heard of the mad old man who went crazy over his romantic books and imagined himself a knight errant, setting out on a series of misadventures with his loyal neighbor and squire, Sancho Panza, tilting windmills and generally playing the fool? Quixote’s fame was nearly instantaneous from the time of the novel’s publication during the Golden Age of Spanish Literature, in the early years of the 17th century. Beloved and admired as it is, Don Quixote has always represented a paradox: is it farce or tragedy? clownish nonsense or a deep meditation on the existential condition of humanity? Of course, the concensus of generations of enthusiastic readers over four centuries is that it is both. Don Quixote is a ridiculously foolish clown, but he is OUR clown, he is US, as we strive for dignity in the face of a seemingly farcical world. He is the greatest comic invention in the entirety of the world’s literature. To translate this huge sprawling novel to the stage is an impossible dream. At best, a stage translation can only hint at the full glory of the story. Choices must be made. Emphases must be considered. The result must be imperfect. It is, in a word, a quixotic undertaking. Playwrights Peter Anderson and Colin Heath, and their company of skillful comedians, have taken Don Quixote as an occasion for some delightful masked theatre, traditional clowning, polished slapstick, inspired silliness, and only a hint of gravitas. Many favorite episodes are here, including, of course, the famous encounter with the windmills and the frightening engagement with the Knight of the Mirrors, who forces the Don to see himself as he truly is. There is also the scene with the innkeeper who dubs Quixote “the Knight of the Woeful Countenance,” and the romance with Dulcinea. The stories are told by masked players using clever props and tumbling about a well-designed multi-level set (by Jackson Currier). Ron Campbell as Quixote is fantastically funny as he creates the illusion of his nag Rocinante using a broomstick and a watering can. His pop-eyed demeanor and flamboyant poses are everthing one would wish. As his foil, Sancho Panza, John R. Lewis displays a mastery of low comedy, delivering the funniest series of fart jokes since the bean-eating scene in Mel Brooks’ “Blazing Saddles.” A particularly exciting and telling sequence is performed by the entire ensemble at the start of the play, as they juggle the books that drive the good Don mad, flinging them about the stage as Quixote grabs them from the air to devour. It is a wonderful set piece. The humor of this Don Quxote is as broad as a barn. An encounter with sheep devolves into a pillow fight, with sheep (pillows) being flung into the audience, to be, not unsurprisingly, flung back at the actors, who often leave the stage to barnstorm through the theatre, engaging audience members all the while. It’s great fun. The deeper themes of the story receive little emphasis, but they are not disregarded, and thoughtful reflections on the nature of fantasy vs reality, good vs evil, hope vs despair, are not absent. This is Cervantes light, but Cervantes it is. “Don Quixote” plays at the Forest Meadow Amphitheatre at Dominican University in San Rafael through August 30. For further information click here. “Don Quixote” by Peter Anderson and Colin Heath, adapted from the novel by Miguel de Cervantes Saavedra. Produced by Marin Shakespeare Company. Director: Lesley Schisgall Currier. Costume Design: Maria Chenut. Fight Director: Richard Pallaziol. Lighting Design: Ellen Brooks. Mask Design: David Poznanter. Properties and Set Decor: Joel Eis. Set Design: Jackson Currier. Sound Design and Composer: Billie Cox. Don Quixote: Ron Campbell. Sancho Panza: John R. Lewis. Ensemble: Cassidy Brown, Rick Eldridge, Lee Fitzpatrick, Monica Ho, Jed Parsario. Posted in Reviews.Tagged Charles Kruger, Colin Heath, Don Quixote, John R. Lewis, Marin Shakespeare Company, Miguel de Cervantes, Peter Anderson, Ron Campbell, San Francisco theater reviews, theatrestorm.